The past few weeks have seen Samos island drenched by days of winter rain storms. Most of the farmers are happy. Winter soaking keeps Samos a green island and is essential if the fruits, vegetables, olives and vines are going to flourish in the hot summers. But for thousands of refugees both in the camp and in their tents and shacks in the olive groves around the camp, it is nightmare time. I am consumed with frustration and anger. For the past 5 or 6 winters the refugees on Samos have faced catastrophe. Every winter there are no preparations. Every winter! I am reminded of a conversation with Medicin Sans Frontiere when they first came to Samos. The project leader thought Samos was one of the worst places he had been to, because unlike many of the other places he had worked in which had nothing due to war or natural disasters, Samos did have existing resources and facilities that were desperately needed by the refugees but were not made available. This conversation took place over four years ago and NOTHING has changed. This month thousands of human beings have been freezing and soaking in tents and shelters, living in a swamp when there are schools, halls, hotels, army bases …… standing empty. 3 weeks ago the central government asked the local authority to release some of its vacant buildings to provide emergency accommodation during the bad weather. Such are the strained relations between the central government and the frontier islands that it came as no surprise when they refused this request. I for one don’t know how some of these people who control these resources can sleep at night. In the midst of all this I see Oxfam’s latest report on Moria Camp on Lesvos getting coverage. I wonder how much that cost them to tell us the bleeding obvious? Why do they persist with these reports when they must know they have no impact? Yesterday afternoon the rain stopped. People flooded out of the camp. Driving back to the village that evening I saw that the children’s play area on the Samos town sea front was bursting with young children and their families, playing, relaxing and talking. The main form of communication between the Camp authorities and the refugees is through a public address system. It is through announcements over the tannoys scattered through the camp that people learn of their appointments as well as general camp issues. Those camped out in the woods can’t hear, neither can those who are out of the camp. Many announcements get missed unless you have a friend who can message you when they hear your name called out. If the call involves an interview appointment and you miss the meeting because you never heard it then you go to he backof the queue. Yesterday, gave a lift to a young guy. Turned out he was a refugee from Morocco and he was 10 km into his 40 km walk back to the camp in Samos town. He was coming from Karlovassi where he had hoped to get on to the ferry and escape from Samos. His Syrian friend managed to get on under a lorry but in the end he didn’t try. He said that the problem in Karlovassi port was the presence of Albanian smugglers who were telling the port police who was trying to escape. He said that the smugglers wanted all the refugees to use (pay) them to get out. This is the first time I heard this and I wonder at its truth. But what can’t be denied is that refugees are constantly at risk of exploitation and especially when it comes to arranging escapes from Samos. There is a significant business in supplying false travel documents and arranging transport. Shelters of all shapes and forms now come right down to the road leading to the top gate into the camp. It is an extraordinary sight. A complete jumble of almost interconnecting structures with layers of blankets and plastic and nylon covering to keep out the rain and cold. Anything that can add to their ‘comfort’ is used. You would be lucky today to find an empty wooden pallet in Samos town as they are much prized as flooring as is cardboard. It is impossible not to marvel at the ingenuity amongst this chaos. As in all recent previous winters on Samos so many of the refugees will get through because of their own efforts. Hamid and I counted over 120 cars parked along the road into the camp at 9.30 am on Wednesday. Both of us asked the same question. What are all these people doing in the camp? 12 minors arrived on Monday. All came from Egypt. There were no injuries despite the weather and all the minors were accommodated in a minors’ shelter. Recent weeks have seen a surge in arrivals from Egypt. This week UN officials have been meeting with the Egyptian government to see how they can moderate/stop the flow of refugees into Europe and out of Egypt. But experience of refugee flows on to Samos would suggest that there must be specific factors which explain the recent influxes of both Gazians and Egyptians. Open Doors, the grocery store has now been open for 2 months. It has been one of the very few positive developments for refugees on Samos for some time. The shop is always busy. Supplies are coming through from Athens on a regular basis as the ferries and winter weather allow. The store room which was initially thought to be adequate is not sufficient so on almost every ferry from Pireaus there is a least one pallet for the shop, often more. No sooner restocked then depleted. And when winter storms halt the ferries there are shortages until service resumes. The low prices and the range and relevance of the food stuffs has made life a little better for many. But it has fast become more than a shop. From the moment of its opening the shop has embraced its users especially in asking what people want to find in the shop and then going out to find the stuff. This alone changes the relationship between the customer and the shop. There is a tangible sense that the shop is with them and claimed by them. It is a place that sells things that they have chosen and want. It is cheap. It is a place to go and be welcomed, a place to look for help, a place to laugh, a place where children can be indulged (the sweets are very cheap). And of course it rarely closes during the day. For some months the mayors of the frontier islands have been campaigning that the lower VAT rate which is applied to these islands be allowed to continue into 2019. On the last day of December, central government agreed to the extension, to be reviewed every 6 months. But to the fury of the mayors, central government has now formally linked refugee numbers in the island hotspots to the VAT rebate. Quite simply, if the hotspots continue to be overcrowded the VAT relief remains. If not it will be removed. 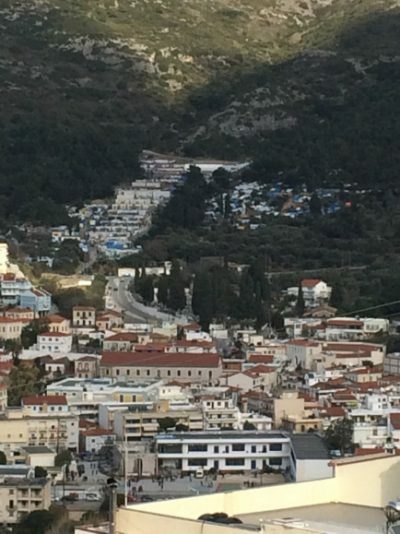 In the middle of December, the minister for migration promised to remove 2000 refugees from Samos by December 20th. Nothing happened. At the same time, the minister promised that by February 2019 the camp would be moved away from Samos town. Of course nothing is happening. Hamid a close friend from Aleppo has returned to Samos for 2 weeks to see his partner. A year ago he was fighting for his life in the mountains of Croatia and Bosnia as he made his way, on foot, from Athens to the Netherlands. On two occasions when he was caught by Croatian border guards he was dumped in remote forest areas in the snow covered mountains. On the last occasion he and his traveling companion went five days without food and shelter. They survived in part by burning their clothes. One year on, Hamid now has asylum in Holland. He has a passport. He is now free to travel without fear. Why was he and thousands upon thousands like him forced to suffer? So on into 2019 which for so many will be another crappy year.